KMAK is four days of fun, fellowship, and spiritual growth. Worship rallies each day focus on the spiritual theme for the week, which are reinforced by fun cabin devotionals and activities in the evening. Morning begins with individual quiet times. After breakfast, a cabin devotion, and a morning worship rally, students head off to their activities for the day. The afternoon worship rallies focus on a mission project selected by KMAK. Students have three electives, or classes, throughout the day. See the activities listed below. Free time allows campers to go out and have fun by revisiting some of their favorite activities or find new ones like rock wall climbing, swimming, gaga ball, and more. 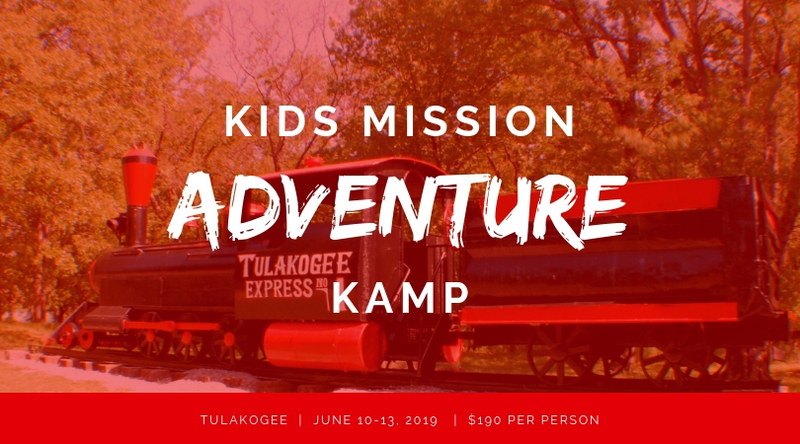 The cost includes transportation, a camp t-shirt, a group photograph, all meals, and the camp activities. Activities are subject to change each year by the KMAK staff, but in the past have included: Archery, Riflery, Crafts, Fishing, Soccer, Girl’s Basketball, Boy’s Basketball, Drama, Softball, Water Areobics, Volleyball, Golf, Beauty Works, Scrap Booking, Wall Climbing, Putt-Putt, Pinewood Derby, Frisbee Golf, Jewelry Making, Duct Tape Crafts, Flag Football, Kick Ball, and CPR / First Aid. What to pack in my suitcase? Click here to visit the Tulakogee Conference Center website. Choose “KMAK” from the fund drop down box. Add your campers name in the memo line.